The newest model of the King Air 200 series, the Beechcraft King Air 250 is especially optimized for Hot & High conditions. Its new composite winglets and propellers deliver significant improvements in takeoff performance, climb and max speed. The Hawker Beechcraft King Air 250 is a modern aircraft built upon a foundation of time-tested excellence and decades of reliability. The model was originally based upon the Super King Air 200 model, which was launched in 1970. 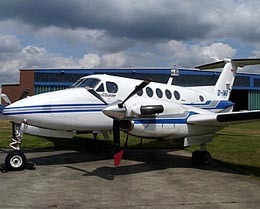 In 1996, the "Super" part of the name was dropped and the aircraft became known simply as the King Air B200. Over the course of its successful run, 2,500 individual King Air B200s have been delivered. 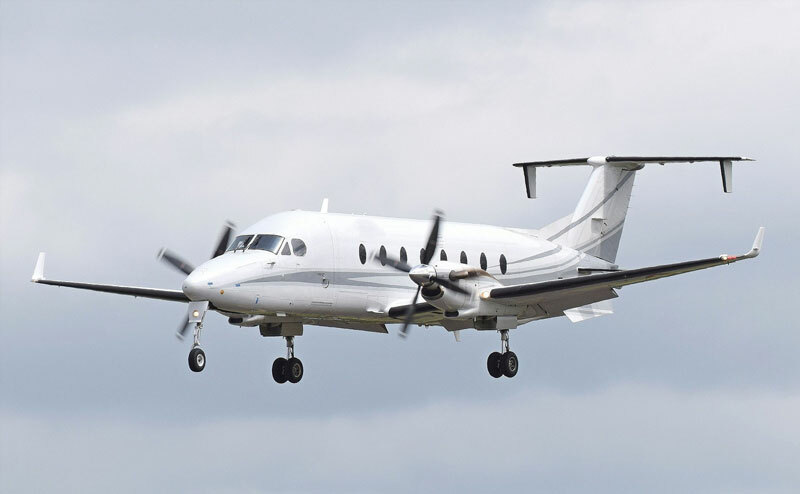 Today, the latest B200 derivative is marketed as the King Air 250 and is available in multiple variants. Focusing on power, performance, and comfort, the 250 offers passengers several improvements over the original Super King Air 200 including composite scimitar propellers, a Ram Air Recovery system, and drag-reducing winglets. The model delivers superior takeoff performance, speed, range, and climbing ability. In short, the King Air 250 is an extremely reliable twin-engined turboprop with impressive transcontinental range, speed, and interior comfort. 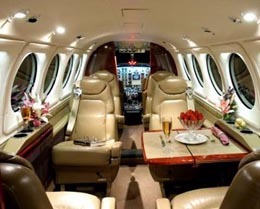 The hand-crafted interior cabin of the King Air 250 feels notably spacious and comfortable. Much of this is thanks to the clever subtleties of the 250's design. Its understated square-oval cabin provides much-appreciated head and shoulder room to passengers, which significantly enhances the spacious atmosphere of the aircraft. In the flight deck, lighted chart holders and ergonomic yokes maintain the pilot's comfort and supplement efficiency and focus in the cockpit. The comfortable first-class seating and elegant interior cabin have been painstakingly designed to create an enjoyable inflight environment for passengers. Many amenities are available to further customize flights. The 250 can most comfortably hold eight or fewer passengers, but it has a maximum capacity of ten. The 250 also features higher wing loading for a noticeably smoother ride with less airframe vibration than many of its competitors. With all of these comfort and luxury features combined with an impeccable safety record, the King Air 250 is one of the most balanced and reliable business aircraft in the world. 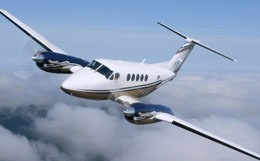 The King Air 250 also has very impressive performance characteristics when compared to competing models. It has excellent takeoff performance, requiring only 2,111 feet of runway length at sea level, which provides the model with virtually infinite options in terms of landing and takeoff sites. With its impressive maximum range of 1,800 nautical miles and its swift maximum cruising speed of 310 ktas, the 250 has much to offer transcontinental travelers. This performance is thanks mainly to superior engines, as new 250s come standard with powerful Pratt & Whitney PT6A-52 engines, which each provide 850 shaft horsepower. The 250 also boasts a maximum payload of 2,220 pounds providing not only great flexibility in passenger capacity, but also the ability to transport ample amounts of luggage and cargo. Because the 250 is so noticeably capable across the board, it makes a very efficient and desirable travel solution for a wide variety of missions. Whether traveling for business or pleasure, the 250 is an ideal option for the vast majority of transcontinental voyages. For more information about chartering, leasing or buying a King Air 250 please contact us by calling +44-20-3874-8091 or send us an email here.